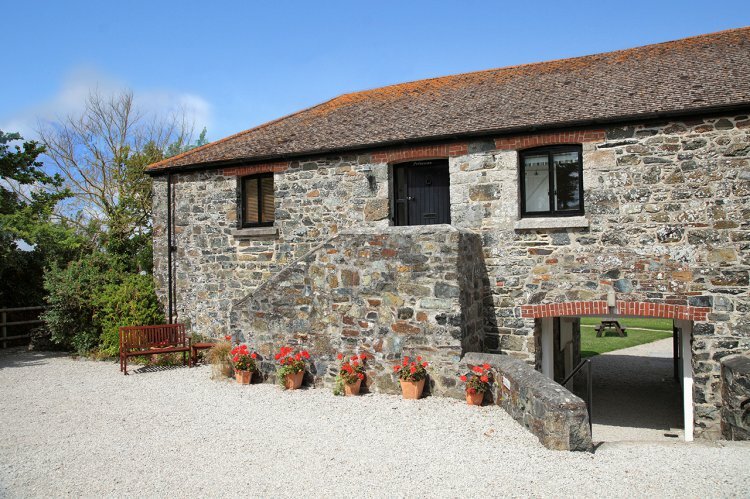 'Polurrian' is a beautifully appointed, beamed apartment, one of a group of barn conversions, set around a communal courtyard just a level 50mtrs walk from Mullion village. The property boasts the best of both worlds as it is set back and peaceful yet only a two minute walk to the shops, restaurants and pubs of Mullion. There is also a public footpath with several beaches within walking distance. Having been refurbished to a modern style, all of the décor and furnishings in Polurrian are new. Entered up a short flight of stone steps leading into the hallway. To the left is the Lounge/Diner with exposed beams and high ceiling, comfortable seating for three people, LCD TV, DVD and Freeview, CD/Radio and contemporary dining table and chairs. The Kitchen is fully equipped with fridge freezer, washing machine, dishwasher, microwave, electric oven and 4-ring hob with extractor over. Bathroom has ceramic floor and ¾ tiled walls, with toilet, handbasin with shaver light over, bath with electric shower over, heated towel rail and wall mounted electric heater. Double bedroom has 4'6" double bed with bedside tables and lamps, double wardrobe, and chair. Single bedroom has 3' single bed, bedside table and lamp and a double wardrobe. Please note three is the maximum occupancy. Quality linen and towels are provided. Outside are communal gardens, and a bench is provided for guests to enjoy the sunshine. Property has its own off-road parking space a few steps from the door. Heating is by storage radiators. Rental includes WiFi, bedlinen, towels, electricity and heating. Regret no pets and no smoking.